4. 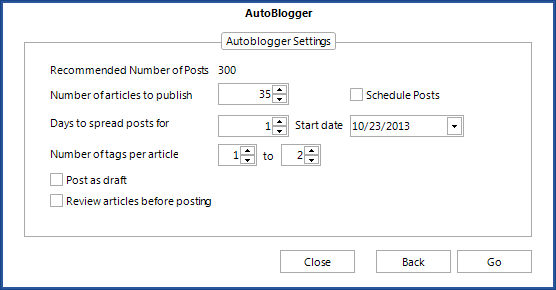 After you set it up, click Category to select which category you would like to post to. Note that you can change that later before posting too. A. You can click on each title and change it. C. If you have several blogs by clicking here you can change the account you will be posting to. D. By right-clicking you will bring the contextual menu, and you can delete or preview the selected article. You can also tell Kontent Machine to change the title or the tags. E. You can edit the articles directly here.